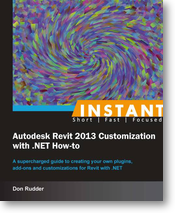 I just got my hands on “Instant Autodesk Revit 2013 Customization with .NET How-to“. As a designer, I am always looking on ways to improve efficiencies and workflow. A lot of the work I do in Environmental Graphic Design utilizes sign location plans and message schedules using Adobe Illustrator and Filemaker Pro. As more and more architecture firms transition to Revit, consultants need to do the same to keep up and better collaborate. I am hoping this eBook will help me better understand Revit and how its customization of elements can change my everyday workflow.